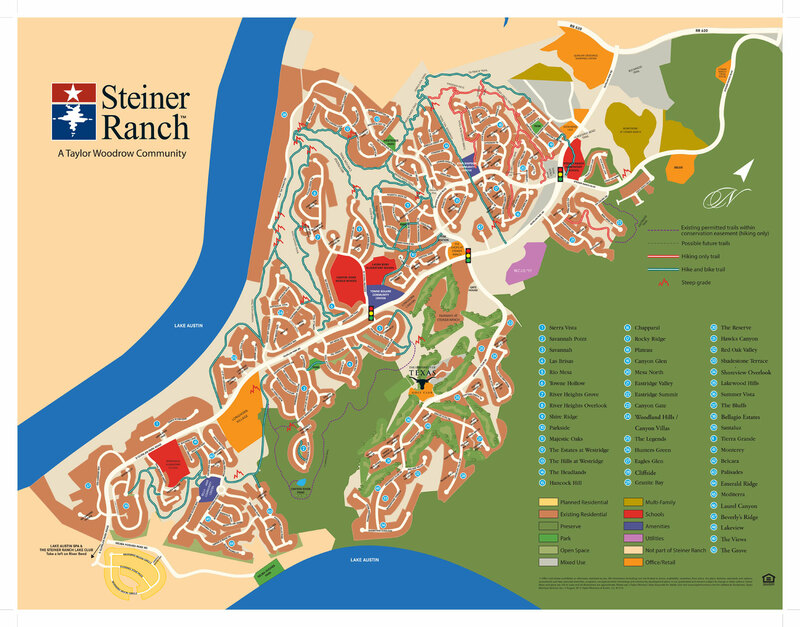 Steiner Ranch is a 4,600 acre master planned community in Northwest Austin. Steiner Ranch is most known for its endless amenities including full time activities planner on staff. Yes, that’s right. Steiner Ranch employs someone full time to plan activities for the neighborhood. Much like a cruise director on a cruise ship, however not as cheesy and without the water! Steiner Ranch also has its own Private Lake Club on Lake Austin, two community centers, pools, nature trails, basketball courts, picnic areas and tennis courts. Convenient to many of Austin’s employers, Lake Austin and Lake Travis, living in Steiner Ranch is more like a vacation. Scroll Down to Read our Steiner Ranch Neighborhood Guide. Steiner Ranch is located in Northwest Austin between Lake Austin and Lake Travis and can be accessed off 620 from N Quinlan Park Rd or Steiner Ranch Blvd. One thing to keep in mind if you decide to live in Steiner Ranch is your commute. If you are going to commute to Downtown Austin during rush hour, the 620/2222 intersection can get backed up. Explore other Northwest Austin neighborhoods. Steiner Ranch is located in Northwest Austin’s 78732 zip code. Part of what makes Steiner Ranch so appealing to so many people are the range of homes that can be found there. From multi-million dollar estates on Lake Austin to more modest homes around 2,000 sq ft in the low $200’s, there’s something for everyone in Steiner Ranch. Use the Steiner Ranch home search tool above to find homes in Steiner Ranch that meet your budget. Steiner Ranch has been developed by several builders. With such a large geographical area with such vastly different homes, they’ve divided this area into several smaller pocket neighborhoods. Sometimes these neighborhoods are where one builder has built and other times its just a smaller area where homes of similar size and price can be found. Use our links below to explore these areas. What sold recently in Steiner Ranch and for how much? Where can I find pictures of homes that actually sold? How many days does it take to sell a home in Steiner Ranch? How many homes are currently for sale in Steiner Ranch? What’s the median sold price in Steiner Ranch? What does the 90 day historic market trend look like in Steiner Ranch? How’s the Steiner Ranch market trending? All of these questions (and more!) can be answered on our Steiner Ranch Sold Data Report. Steiner Ranch is known for its top rated schools, four of which (Steiner Ranch, Laura Bush, River Ridge and Canyon Ridge) are located within the boundaries of Steiner Ranch making your morning school run pretty quick. What really draws people to Steiner Ranch (other than the top rated schools) are the fabulous amenities you’ll find there. Steiner Ranch has three community centers with pools, tennis courts, basketball courts, picnic areas, playscapes, multi-purpose ball fields and 20 miles of hiking trails. There are also over 150 organized sports teams that play in Steiner for those competitive types. Plus, because of where Steiner Ranch is located, you can launch your boat on either Lake Austin or Lake Travis in just about 5 minutes. The UT Golf Club is a 7,412, par 71 championship-caliber course with views of Lake Austin and the Balcones Canyonlonds Natural Wildlife Preserve. A private club, members enjoy access to the course, state of the art fitness center, clubhouse and distinctive practice facility. Steiner Ranch is not considered a walkable neighborhood in terms of coffee shops, restaurants and shopping at your doorstep but that doesn’t mean there aren’t other amenities that are within walking distance. For a complete list of nearby amenities, check out our Things to Do section. Randall’s opened up a large store at the corner of 620 and Quinlan Park Rd, offering residents a grocery shopping choice right inside Steiner Ranch. For larger trips, try HEB just north on 620 and if you’re willing to drive a few more minutes, there’s a Walmart a few minutes north of HEB. One of the best reasons to live in Steiner Ranch are all of the amenities that are available within your neighborhood. Not just 1, but 3 community centers are available for residents to use with pools, tennis, playgrounds, picnic areas, sport courts, club house and covered pavilions for kids parties. Steiner Ranch even employs a full time activities director (yes, much like a cruise) to plan activities and events for residents. If you’re new to Austin, or want to live everyday life like its a vacation, there is truly no better neighborhood in Austin to do this. Don’t miss the 20 miles of hike and bike trails or the private boat ramp either! Steiner Ranch Steakhouse is a popular stop if you’re looking for meat and potatoes. If you’re more looking for a vew, or want to impress tourists try The Oasis. You can sit on their decks and enjoy the great view of Lake Travis. Plus, the food’s pretty good too. For sushi, try Cho Sushi Japanese Fusion which always gets great reviews. In the mood for Chinese? Try Hunan Riverplace Restaurant just down the road off 2222. For some locally owned flavor, try Cups and Cones on Quinlan Park Road, Perky Cups Espresso on 2222 or Texenza Coffee on Hill Country Blvd. If you’re more into the national chains, visit Seattle’s Best on Hill Country Blvd or Starbucks on 620. If you are looking for a traditional gym try Wild Basin Fitness on Quinlan Park Rd, Anytime Fitness on 620 or Lake Travis Fitness, also on 620. If you’re a member of the UT Golf Club, they have a state of the art fitness facility not to be rivaled by any other gym. Raymond Stoklosa and Rebecca Stoklosa are Northwest Austin Realtors specializing in Steiner Ranch homes. Whether you’re looking to buy or sell a home in Steiner Ranch, Raymond and Rebecca know the area well and have the experience and tools necessary to make your next real estate transaction stress free. For more info about who we are and how we work, check out Buying a Home in Steiner Ranch and Selling a Home in Steiner Ranch.